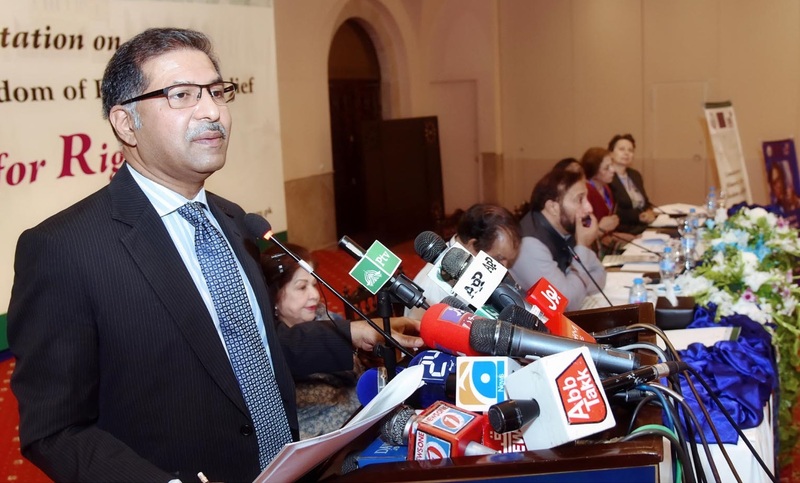 ISLAMABAD: Caretaker Minister for Information and Broadcasting Barrister Syed Ali Zafar on Tuesday said that the government should challenge the judgment that ordered that civil servants must mention their religion on a form, as nobody should be asked to disclose religious beliefs while seeking employment. “Nobody should be asked to disclose religious beliefs while seeking employment and the government should not be so intrusive and nobody should be discriminated against in the matter of employment,” he said while speaking here at a consultative session on the minority rights, freedom of religion or belief and faith for rights. The caretaker minister said that growing poverty, lack of education and galloping population were causes of extremism and religious intolerance, and everybody should come together to resolve the issues. He said that Quaid-e-Azam Mohammad Ali Jinnah had personified the vision of Pakistan. He said that extremism of any kind was a curse and religious intolerance that led to violence was its worst form. However, it was an issue not only in Pakistan but a worldwide phenomenon also, he said. In many cases, the reasons for extremism and violence against minorities were personal vendetta or political and territorial ones, he said, adding that the extremism should not be associated with religion. “No religion that I have studied talks about committing violence against other religions. No religion teaches intolerance and every religion teaches love,” he said. “Our people are peace loving just like others elsewhere in the world. In Pakistan, we just don’t shake hands, we embrace one another so that the spirit of love is transmitted,” he pointed out. The minister said that the government, which was open and transparent, would want a powerful National Commission for Human Rights, which should be given funds and made self-sufficient. If the commission were not given funds, it would be subservient to the government, he emphasised. “We have to make every institution independent. Every institution, whether it is an investigation agency, court or security agency, should be powerful in its own right.” He said that no one had right to interfere in the choice of other people about their religious beliefs. “It is the fundamental right of everybody to live according to their own conscience. It is a responsibility of the government to ensure that no citizen imposes his will on others. The only way we progress is by eliminating extremism, whether by physical action against terrorism or by educating the citizens,” he said. Ali Zafar said that Pakistan was made a scapegoat after the war in Afghanistan and the West then abandoned the country. Yet Pakistanis have single-handedly fought against the terrorists and succeeded, he said, adding that now there was a need to ensure that such elements never raise their head again and this too can only be achieved through learning. He underlined the need for reforming the educational system and teaching students about subjects like interfaith harmony and tolerance just like hygiene and civics were taught in the earlier times so that true human right concepts remain ingrained in people’s minds. Supporting the idea of a limited government, he said that the government that overrode religious beliefs of others, according to him, was not a limited government.